58' Riviera Sport Fisherman FINN MCCOOL The 58’ Riviera is one of Riviera’s top performers. She offers a three stateroom, three head layout with a huge air conditioned flybridge, plus mezzanine seating in the cockpit. 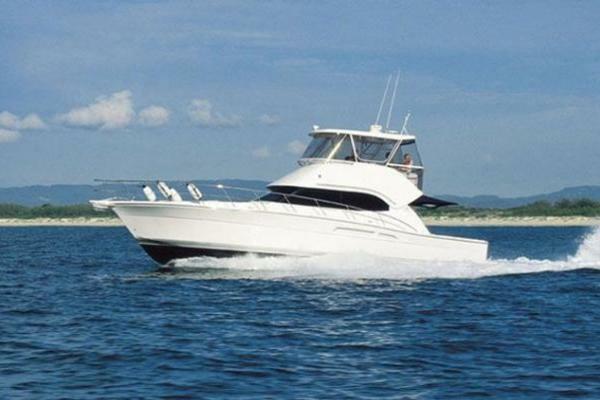 Upgraded C-30 Caterpillar motors cruise this Riviera near 34 knots, topping out near 37 knots.Low hours, great electronics, Pipewelders Custom hardtop and bow thruster make this 58' the best buy on the market. United Yacht Sales New Jersey would love to guide you through a personal showing of this 58' Riviera Flybridge Convertible 2007. This yacht for sale is located in Fort Lauderdale, Florida and priced at $895,000. For a showing please contact us by filling out the form on this page and we will get back to you shortly! Three cabin, three heads with master amidships to starboard. Ensuite head with stall shower, designer style sink and solid surface counter. Cherry cabinetry and vanity. Master has full wall cherry paneling. Guest is to port with twin bunks and access to day /guest head. The VIP is forward with island Queen berth, ensuite head and stall shower. All cabins have natural light from deck hatches.